Join Visit Alexandria’s Instagram video contest! Post a video showing us what you love about Alexandria. Visit Alexandria will select a winner for an Alexandria getaway prize package. Other favorites will be featured on our website and social media. Upload your video now: Contest ends August 8, 2016. 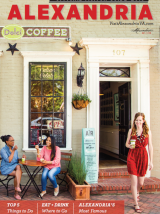 Post: Make a video of what you love about Alexandria: go to your favorite spots and talk about your favorite activities, shops, restaurants, or sites. Post it on Instagram. Tag: Use hashtag #WishYouWereHereInALX and tag @VisitAlexVA. That’s it! We’ll choose a winner and announce it on Instagram. Terms of Agreement: By entering your video in Visit Alexandria’s Wish You Were Here contest, you are giving Visit Alexandria permission to use your video. It may be used in full or edited for use on social media, website, blog, marketing, advertising, and others. Employees, officers and representatives of Visit Alexandria as well as their immediate family and household members are not eligible.